Intuit harnesses employee feedback, rich data, and the latest website technology to improve the employee experience—globally. Intuit is a leading provider of personal finance, small business accounting, and consumer tax preparation software. Its flagship products include QuickBooks®, Quicken® and TurboTax®. Intuit has been listed among the Fortune 100 Best Companies for much of the last decade—largely because it values its 8,000 global employees as highly as its millions of customers. Intuit was an early adopter of consumer-driven plans, and for the last 10 years has continuously evolved its programs to help employees improve their health and financial security. Since 2007, Intuit’s user-centric benefits website and commitment to robust year-round education has assisted employees in using and appreciating their benefits. Now, that site supports employees in 10 countries—featuring culturally relevant content, images and technical infrastructure to offer all employees a personalized experience. 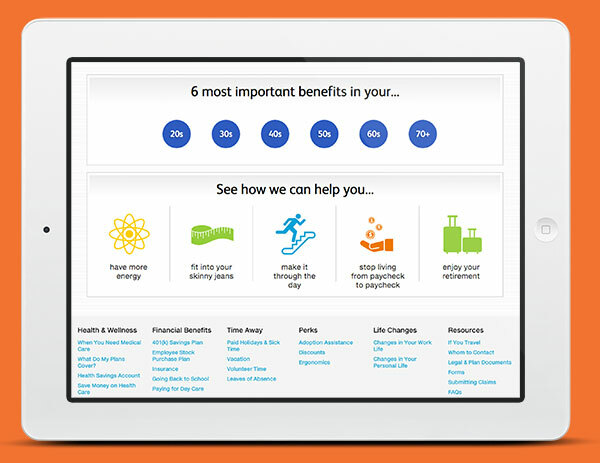 We redesigned the site in 2014, driven by Intuit’s commitment to continuously improve the employee experience. We took our cues from Intuit’s own “Design for Delight” approach to product design, and made our decisions about site design and content organization based on in-depth employee feedback gathered through one-on-one interviews and focus groups. No matter where Intuit employees are—at home, at work or at the doctor’s office—or what country they’re in, their benefits go with them and look flawless on any device. I appreciate the customized benefits recommendations based on our stage in life. I feel it’s so much more relevant to me. The new site is filled with behind-the scenes technology that makes finding information easier for employees and their families. Whether visiting from work, home or a mobile phone, everything is oriented around the ways employees view and think about benefits information. Sarah Lecuna, Intuit’s benefits program manager, was recognized by Workforce magazine in 2014 as an industry “Game Changer,” and was the sole benefits manager featured in the publication’s coverage of the fifth anniversary of the Affordable Care Act. She also is a well-received presenter at industry events, including the Human Resource Executive Health & Benefits Leadership Conference, where attendees were very interested in learning how to emulate Intuit’s benefits results.